Ghost Towns In Eastern Washington? Doing some researching work lately I've come upon some towns that aren't "alive" any longer. Methinks they've turned into Ghost Towns?? Further looking and I found that Beverly was named about 1905 by H. R. Williams after Beverly, Massachusetts, and in its day (1905-1920s) our Beverly was home to hundreds of railroad workers. But of Brents (Lincoln Co), Fletcher (Adams Co) and Bong, I found nothing. And believe me you get many interesting results when you search for "Bong Washington." 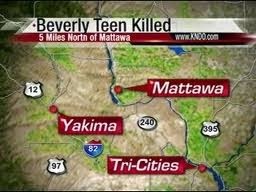 Maybe you will come up with some information on these towns or other long-lost towns of Washington? 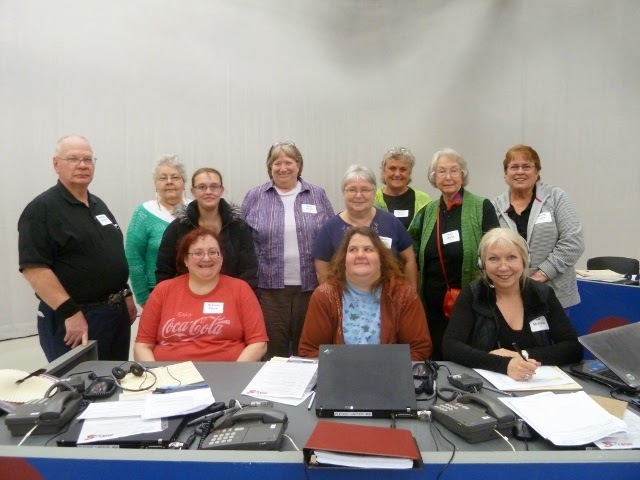 Sunday evening a group of EWGS volunteers gathered to help take pledge calls at KSPS our local public TV station. My oh my did we have a delightful time! 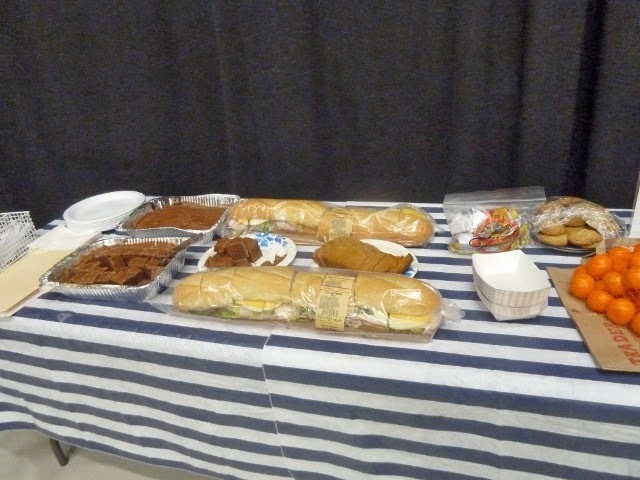 Cheryl Beck is the coordinator and she went over the top and brought wonderful deli sandwiches for the group. With the Tim's Chips and fresh popcorn, we eat and visit our way through the evening in between taking phone calls! 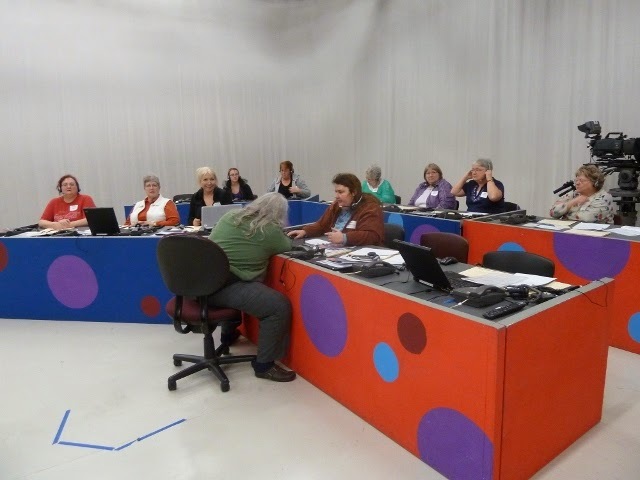 While we were not "live" we took about 80 calls and made a goodly sum for public television in our area. Big thanks to all of you and hopefully we'll rendezvous again......when Cheryl coordinates with the station for their next pledge drive. front pockets and are quite sturdy. 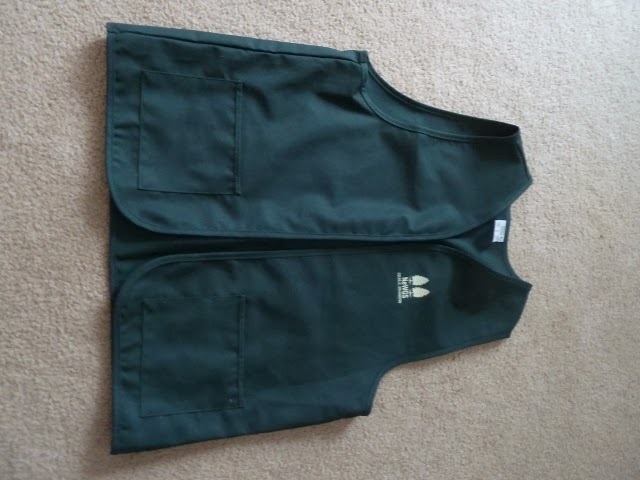 I think having identifying vests for EWGS will be a dandy-fine-good thing for our group. And some 70 of you have agreed and have ordered one. They will be printed by "Grandma Deanie" up in her shop in Colville, so we're supporting a local business. 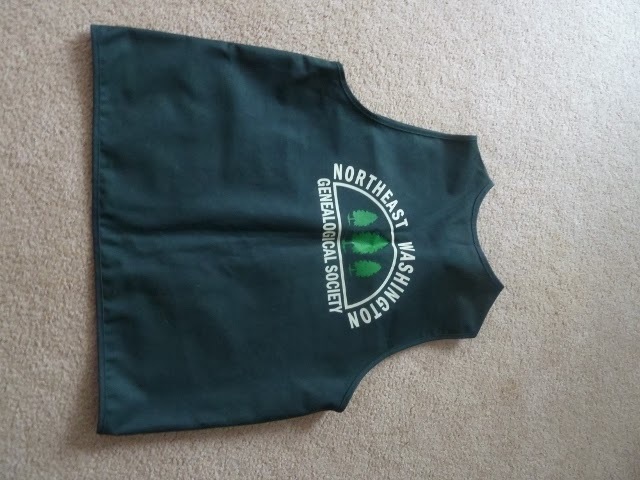 The first order has gone in; if you want now to order one, please send your check made out to Deanie Franz and sent to me, Donna, at 8002 W. Mission Rd., Spokane, 99224-9572. And I will get yours ordered asap. EWGS received a postcard from Lisa Hamilton who has "a genealogy business called Personal Pedigree. 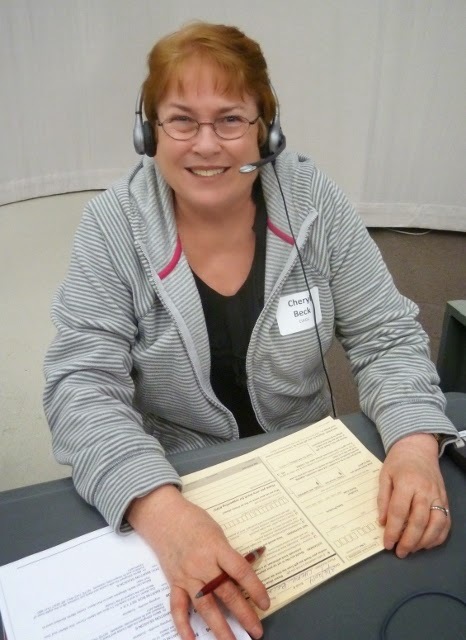 I provide inexpensive and tailored research services to people who want to discover who their ancestors are, find answers to old family stories, or for those who would like a family history documented." Her email is personalpedigree@gmail.com and her website is personalpedigree.com. I am not recommending nor endorsing this lady, nor her services, but had to share with you her website and the doggy photo on that website. That little cocker is digging up something for sure. What would you say to a special interest group devoted to understanding and using Ancestry.com?? Especially now that the full-meal-deal of it will be free to everybody sometime later in 2014. (Free to LDS folks in their homes; free to all others at the Family Search Centers.) This idea was proposed at the last meeting and I think it's a good one. I'll have a clipboard for sign-ups at the April meeting. Doggonit, I did use/post a Maxine cartoon without first asking Hallmark for permission....which was a real DUH on me so I removed the image. Go Google Maxine cartoons to find some for yourself! What things are on your "Things I'll Never Do" list??? 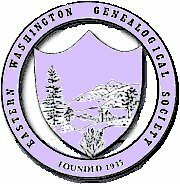 Nearly 70 EWGS members (including guests and one new member...Margaret Ruby) car-pooled to the Eastern Washington Branch of the Washington State Archives for some instruction and a tour of the "paper" archives and the upstairs Washington State Digital Archives. (Thank you, Kathy Bowen, for arranging the car-pooling.) From the comments I heard, it was a great day....... despite the cold and spitting snow. Lee Pierce (red shirt) gave the first talk about what is held in the "paper" archives and how to access that information. Then his two student-interns, Anna and Frank, told us about the digital archives. Frank used the phrase, "The digital archives are the tool to access what's in the paper archives." I never thought of it quite that way. Members Jeanne Coe and Dianne Bongarts (and others) did some researching in the "paper" archives; Mary Holcomb, ever the helper, helps Dianne. Melody Hall is chatting with Debbie Bahn, the archives director. Do-You-Care-Tidbit: Would you have guessed that gray-ponytailed Lee Pierce has written a book about vampires and werewolves in Spokane? It's titled The Vampire Congress and is a Kindle book. Good read too. Our next meeting, April 5th, is our Spring Seminar with Leslie Lawson...... EWGS just keeps getting better and better! !